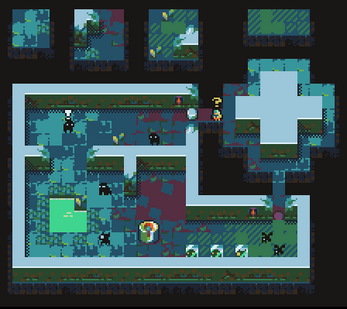 I made this for the 7 Day Roguelike 2018. 8x8 pixel art. The tiles have two themes, one is brighter and more high tech, the other is gloomier and more dungeon-like. 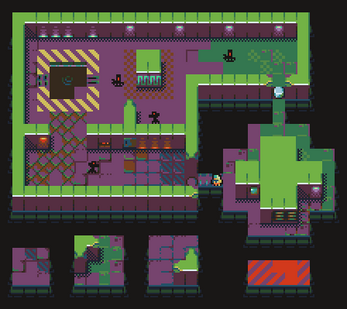 Walls are deliberately simple to make roguelike procedural generation a little easier. An included zip archive contains tilemaps in JSON, TSX, and TXT formats in case that's useful to you. I've included the sprites I made along with a simple attack animation frame for the player character and idle animations for the enemies. You are free to use these graphics for your own non-commercial projects. Please credit me, and send me a link to the project because that makes me happy. If you would like to license this set for commercial usage, please purchase the 'Commercial License' found below. Support this asset pack at or above a special price point to receive something exclusive. The commercial license is covered under public domain CC0. these are beautiful is there a possibility for a 16x16 version? Thank you, I'm happy you like my tiles! I suppose there is a possibility of 16x16 but it is not likely any time soon. I'm busy with other projects right now. If you like, follow my page and you should be notified of any new releases I put out. Thanks. I'm happy people are enjoying it!